Premade hummus is an expensive item at the grocery store. Also, the containers they come in are too small and don’t provide nearly enough hummus to satiate my family’s hummus requirements. When my family wants hummus, they want LOTS of hummus! I much prefer to make my own though and you should too. Making your own hummus is ridiculously easy and is also ten times better than those pre-made versions from the grocery store. The hummus on store shelves will often contain preservatives, stabilizers, and oils that I’d much prefer to avoid. Homemade hummus contains real ingredients like organic olive oil, fresh lemon juice, garlic and tahini. The best news? 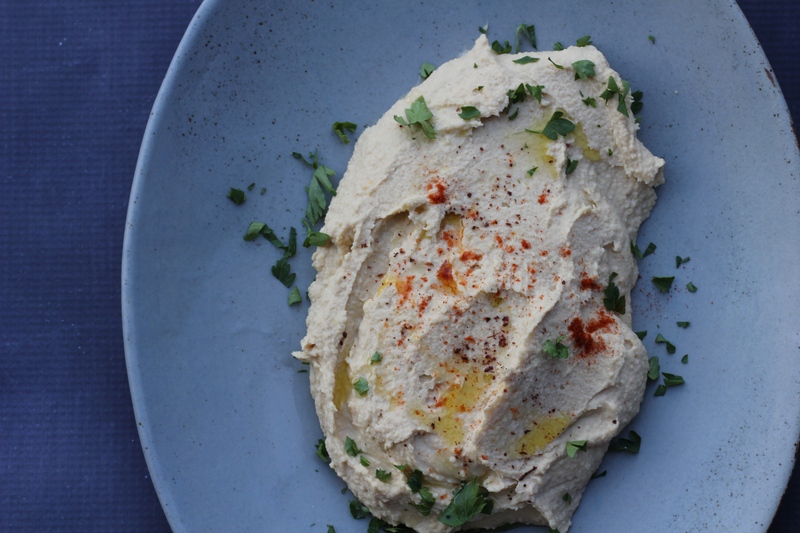 You can make this hummus in 4 steps! It’s super creamy and tastes just like the hummus sold at my favourite Lebanese restaurant. It also very cheap to make.. especially if you opt for dried chickpeas. I made this as an appetizer for a get together that we hosted and it was the hit of the night. My father-in-law made a plea for himself and all of my readers that I should post this recipe ASAP. Although it’s not paleo-friendly, this recipe is gluten and dairy-free. If you want to convert it to a paleo version, try subbing the chickpeas with soaked cashews. 2. Place ingredients into the blender, liquid first (excluding the water) followed by the dry ingredients. Add the water as you process, adding only what you need to create a creamy thick hummus. *The finished consistency will turn out exactly like store-bought or restaurant-style hummus if processed with a high powered blender like the Vitamix. 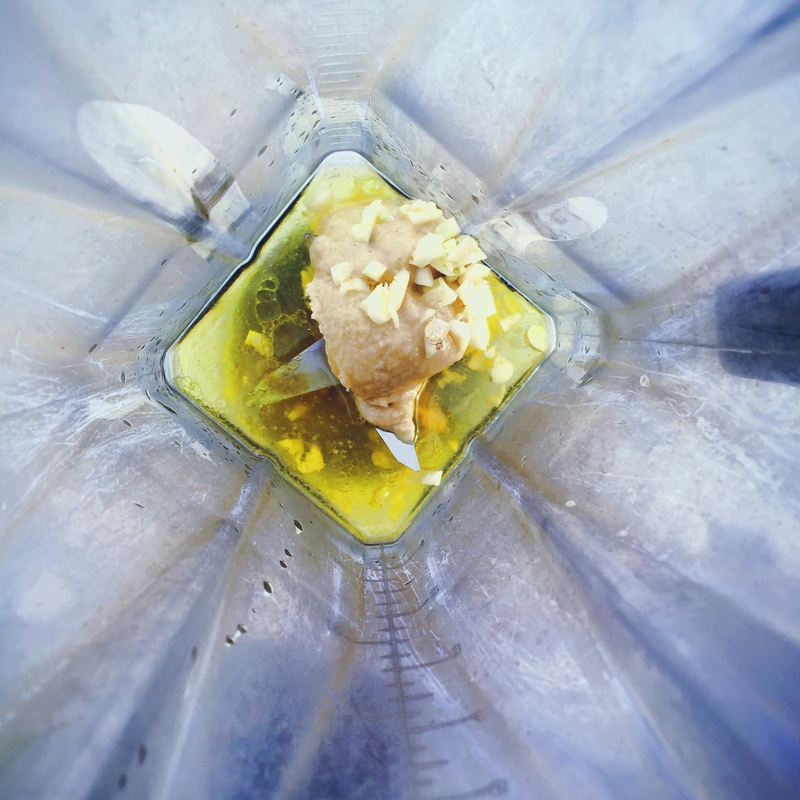 If you are using a regular blender, more water will be needed to process the hummus. Your hummus might be a bit thinner but will be equally delicious! Alternatively, try processing in a food processor. 4. Use a spatula or thin tool to remove all of your beloved hummus! 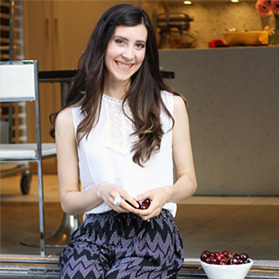 Scoop into a beautiful bowl, top with drizzled olive oil and optional garnish. 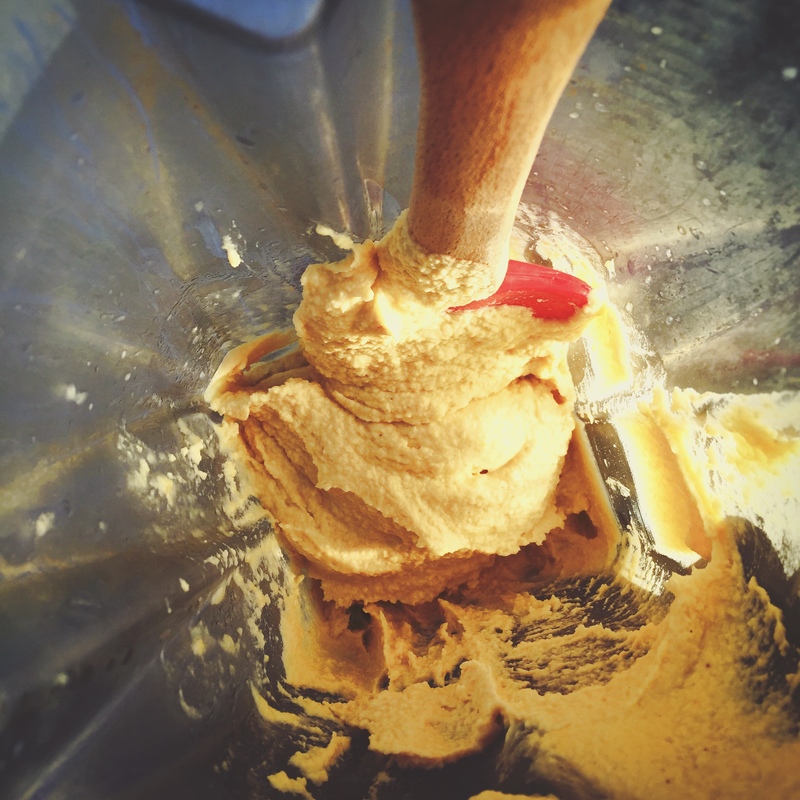 In summary, here are the 4 Simple Steps to Making Homemade Blender Hummus! Place ingredients into the blender, liquid first (excluding the water) followed by the dry ingredients. Add only enough water as needed to process. 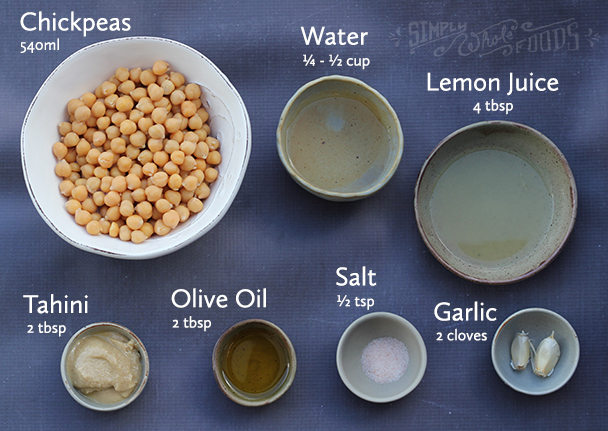 Transfer hummus to a bowl, add garnish, drizzled olive oil and dig in! Hollie: Thank ye! 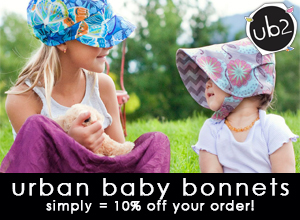 We will be whipping up a batch soon and let you know how it turns out! Hi Hollie, do you have a hummus recipe for people who cannot eat grains? Try using soaked cashews instead of the chickpeas (keeping the rest of the ingredients the same for this recipe). I’ve made cashew hummus before and it’s fabulous. I bet this recipe would taste great as a modified cashew based hummus! Just soak the cashews for around 4 hours in about double the water and then drain before using. If you try, I’d love to hear how you make out! Thanks so much for the nice compliment. I agree, homemade is the way to go, especially when you factor in how fast and simple making hummus is along with the super fresh taste! Beautiful pictures! It’s always so hard to make dips like hummus look good in pictures because their colors are so bland compared to vegetables. Love what you’ve done here! 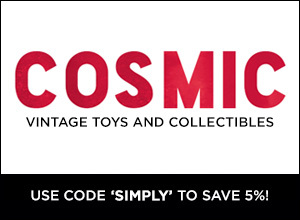 And oo definitely try that scramble – I love it SO much! especially with the chimichurri sauce on top. Literally put that stuff on everything. I would say just to keep true to your style as your pics will reflect that! I love a prime lens like the 50mm and shooting with natural light. Beautiful and simple plates can add a lot too. For colour, I like to add in garnish or small accents. Great advice. Thank you! I’m casually looking around at lenses and if I want to invest in a new one. Just not sure what kind is best for food photography. So great suggestion! homemade hummus is on eof the best things to eat…..its so healthy and delicious i love this quick an easy way. Thanks Kirsten! I agree completely. Homemade just tastes so much better! I hope you enjoy this recipe. I sometimes forget how much of a visual learner I am. The picture of the ingredients made this so easy for me. I have made hummus before but this was way better than my last few batches. I can now give up store bought because I have a tastier winner! No more plastic containers :-). 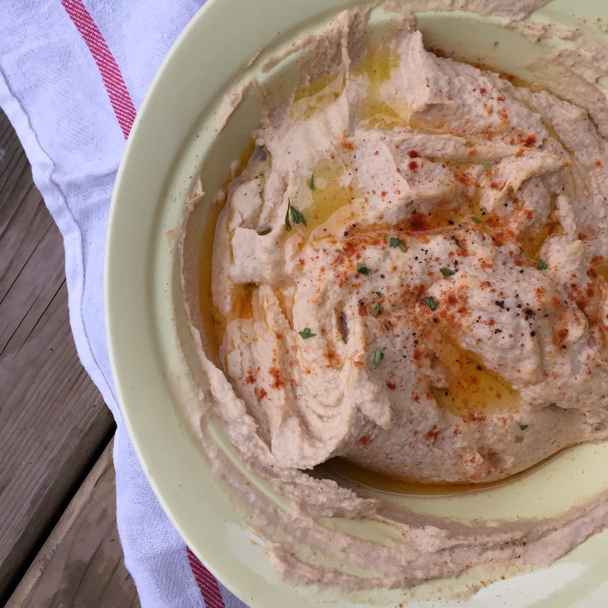 Thank you for this excellent, simple, creamy, yum hummus recipe! Yeah! So happy you liked the recipe Margie! As for the water, I only use as much as required to blend into a creamy texture. Typically the more powerful your blender the less water required! If done correctly, the hummus should turn out quite creamy and have a pretty thick consistency like the pictures above. The water is only added to help the blender process the chickpeas. Feel free to add a bit of olive oil instead-either way this recipe turns out super creamy and flavourful! How many portions would you estimate this recipe makes (if a portion was equivalent to about half a cup?)? Thanks! Your recipe was so much appreciated! On our woodstove in winter, I cook dry chickpeas after soaking, then store what I don’t use in the freezer, with a little of the unsalted cooking water to use in the recipe. Your recipe worked perfectly.